Well we're here and we're settling in quite nicely! I must say that at the minute it does feel rather like I'm on some kind of holiday. Above is the Manchester Wheel which is literally down he road from us, we haven't been on it yet though! Mark started his new job here in Manchester city centre last week and he loves it, he's getting to do some very exciting work already and I'm enjoying hearing all about it when he gets home. I am also enjoying having the time to cook for us both and have tried out a couple of recipes. I think that Mark is quite surprised that I haven't poisoned him yet! I am looking for a job myself. We only got the Internet properly yesterday as BT managed to loose all recollection of us having an account with them (although they did still manage to take money from us) so I have been having a good nosey at what is out there today. Everything is so big and more impressive here compared to little old Scunthorpe back home, I have been forcing myself to get out and about so that I don't rot in the apartment. I do suffer quite badly with nerves so making myself do things can be quite tough at times but all in all I'm enjoying it! On Saturday Mark and me went for a wonder round and looked at the the wonderful clothes and other possessions that we would love to buy, even more excuse for me to get a job isn't it really??? I could spend all day just buying things from this wonderful place. I also don't think that I have had so much coffee from Starbucks! So pleased that it's all going well for you and Mark, Janine. Chris and I went on the Manchester Wheel at Christmas. I actually preferred it to the London Eye! Manchester is a great city and yes, many many Starbucks! There seems to be one on every corner. We might have to have a go on the wheel then although I don't think Mark looks too keen! Yes I keep taking myself off for starbucks I love the frappes!! Is that what they are??? I love them anyhow but I don't think my waist line does! It's a good job I have to walk everywhere! Yeah, frappuccino. Iced coffee. Yummayumma! I love the strawberries and cream icy one they do too. I followed the link to your blog from Laura's, just being nosey really! I have to say I love your jewellery, very modern vintage! Manchester is great isn't it? I used to work in the city centre and I loved it, straight from the office to the bar downstairs, it was very 'Ally McBeal' When we moved last year we only looked within a 50 mile radius of Manc as we'd miss it too much! Have you been to the Trafford Centre yet? Keep enjoying the Starbucks and make sure you go on the wheel!! Thank you for your lovely jewellery comment! I hear that the wheel is coming down this week so we need to get a move on if we want to go on it! Once I find a job I think I will love it here. We've not had a proper night out yet either so I'm looking forward to that! 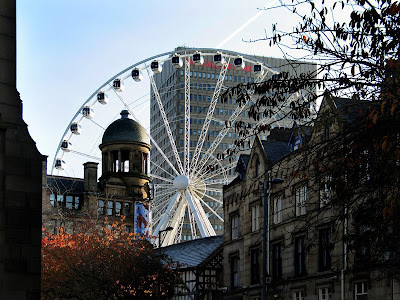 Oh you'll definitely enjoy the nightlife, there are loads of different areas all over the city with lots of bars,Printworks, Deansgate, Castlefield, the little square near Selfridges etc etc, so many places, it is fab! I used to work in the same building as Search Recruitment who seemed to be quite good (central street, behind albert square) they might be worth a look if you are job hunting! Oh, there is also a bead shop in Afflecks Palace but I am sure you have already found that! !